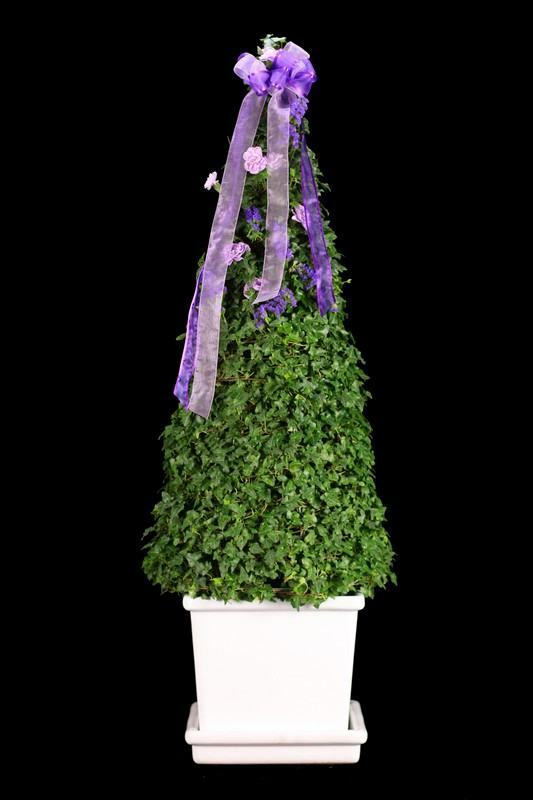 With an ivy topiary plant, residents get something beautiful that can decorate their home's interior. This beautiful landscape feature has been used for centuries to create whimsical spirals, shapes and images. Verdant and lively in design, it is easy to take care of and provides a green ambiance to any home. Sold in a ten inch pot, it weighs 10.5 pounds. Fresh topiary plants are fairly simple to take care of. Between watering live topiary trees, individuals should wait until the top inch of the soil dries out completely. The plant should never be allowed to sit in too much water, or the roots will start to rot. For an extra boost of vitality, the fresh topiary plant should be misted once or twice a week with lukewarm water. This can be done with a simple spray bottle that can be purchased from any garden store. Ideally, the plant should be misted until some of the leaves are dripping water. If it is misted in the morning, the topiary will have plenty of time to dry out by nightfall. In general, most live topiary trees can be fertilized with a 10-10-10 water-soluble fertilizer. This is normally done every four to six weeks. Unless the fertilizer requires different directions, one-half teaspoon should be mixed into a gallon of water. This solution can be used every month in place of a normal watering session. To keep the topiary looking its best, new stems may need to be trimmed from the top and bottom. This can be done with a basic set of pruning shears. Any weak or broken stems should be cut from the base. To keep the topiary growing in the correct shape, loose stems should be tucked or wound around the design as they grow. If the stems do not stay in place, they can be adjusted using plant ties. The ties should never be attached too tightly or they will cut off some of the plant's growth. As the fresh topiary plant grows, it may need to be re-potted. When it has outgrown its current pot, the topiary can be transplanted to a container that is two inches deeper and wider. Any containers used with a topiary should have drainage holes so that the plant does not sit in water. Loamy potting soil can be used to fill in extra space and the root ball should be massaged so that the roots have a chance to spread. Since transplanting a topiary stresses the plant, the owner should hold off on pruning or shaping the topiary for at least a week afterward.